Aliʻiōlani Hale is a building located in downtown Honolulu, Hawaiʻi, currently used as the home of the Hawaiʻi State Supreme Court. It is the former seat of government of the Kingdom of Hawaiʻi and the Republic of Hawaiʻi. Located in the building's courtyard is the famed gold-leaf statue of Kamehameha the Great. The Aliʻiōlani Hale was designed by Australian Thomas Rowe in an Italian Renaissance Revival as the royal palace for King Kamehameha V. In the Hawaiian language, Aliʻiōlani Hale means "House of Heavenly Kings". The name "Aliʻiōlani" was also one of the given names of Kamehameha V.
Kamehameha V laid the cornerstone for the building on February 19, 1872. He died before the building was completed, and it was dedicated in 1874 by one of his successors, King David Kalākaua. At the time, Hawaiian media criticized the building's extravagant design, suggesting that the building be converted into a palace as originally designed. After the establishment of the Hawaiian provisional government in 1893 and the Republic of Hawaiʻi in 1894, some of the offices in Aliʻiōlani Hale were moved to ʻIolani Palace, including the Hawaiian legislature. As a result, Aliʻiolani Hale became primarily a judicial building. 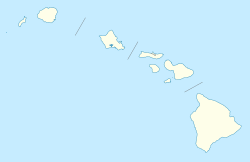 The growing size of Hawaiʻi's government continued to be a problem for the building, however, especially after Hawaiʻi became a United States territory in 1900. In 1911, the building was extensively renovated to help solve these space problems. The entire interior of the building was gutted and rebuilt, giving the building's interior a completely new floorplan. Since the building was originally designed to be a palace, its floorplan was not adequate for its later usage as a judicial building. The new layout of the building fixed this problem. The size of the territorial government continued to grow. In the 1940s, a new wing was added to the building to help alleviate the growing problem of overcrowding. The architects who designed the new wing tried to blend it in with the original building that dated back to the 1870s. Over the next many decades, most of the state judiciary functions moved out of Aliʻiōlani Hale to various other buildings around Honolulu (including the state district, family, and circuit courts). Today, the building houses the Hawaiʻi State Supreme Court and is the administrative center of the Hawaiʻi State Judiciary. It also houses the Judiciary History Center, a museum featuring a multimedia presentation of Hawaiʻi's judiciary, a restored historic courtroom, and other exhibits dealing with Hawaiʻi's judicial history. The building also houses Hawaiʻi's largest law library. In 2010, John Andreoni's firm of King's Custom Koa won the contract to replace the koa wood doors. In December 2005, a capsule buried by Kamehameha V when he laid the cornerstone was located, at the direction of the Joint POW/MIA Accounting Command, by Professor Larry Connors of the University of Denver using ground penetrating radar. The capsule contained photos of royal families and the constitution of the Hawaiian Kingdom, Hawaiian postage stamps, Hawaiian and foreign coinage, newspapers, a calendar and books. The capsule was located to protect it during future renovations, and not retrieved due to concerns of damaging the structure of the building itself. Copper thieves stripped several copper downspouts from the building in 2006. In the 2010 version of CBS' Hawaii Five-0 TV series, Aliʻiōlani Hale is depicted as the Iolani Palace; headquarters for the Five-0 task force with exterior shots of the building being used frequently throughout the series. Aliʻiōlani Hale is one of many buildings in downtown Honolulu listed on the National Register of Historic Places. Within walking distance are the Cathedral of Our Lady of Peace, Hawaiʻi State Capitol, Hawaiʻi State Library, Honolulu Hale, ʻIolani Palace, Kawaiahaʻo Church, Territorial Building, and Washington Place. The King Kamehameha V Judiciary History Center, located in Aliʻiōlani Hale, focuses on Hawaii's legal history and landmark court cases. Admission is free and the public can tour the exhibits from Monday through Friday from 8am to 4pm. Group tours are offered by reservation. Wikimedia Commons has media related to Aliiolani Hale. ^ "Historic Aliiolani Hale – Hawaii State Judiciary Building". Hawaiiforvisitors.com. Retrieved May 8, 2013. ^ Glenda Bendure; Ned Friary (2003). Oahu. Lonely Planet. p. 104. ISBN 978-1-74059-201-7. ^ Song, Jaymes (December 11, 2005). "Search Begins for Hawaiian King's Long Lost Time Capsule". The Victoria Advocate. p. 4C. ^ Jaymes Song (December 10, 2005). "Radar to search for royal time capsule". Honolulu Star-Bulletin. Retrieved December 3, 2010. ^ Chiem, Linda (August 29, 2010). "Hawaii woodworker carves a new business niche". Pacific Business News. ^ Song, Jaymes (December 12, 2005). "Time Capsule of Hawaiian King Located". The Victoria Advocate. p. A3. ^ "Radar quickly pinpoints site of Kamehameha V capsule". Honolulu Star-Bulletin. Associated Press. December 11, 2005. Retrieved December 3, 2010. ^ "Copper Thieves Hit Supreme Court Building". KITV. July 31, 2006. ^ "King Kamehameha V Judiciary History Center". official web site. Retrieved 2009-11-10.